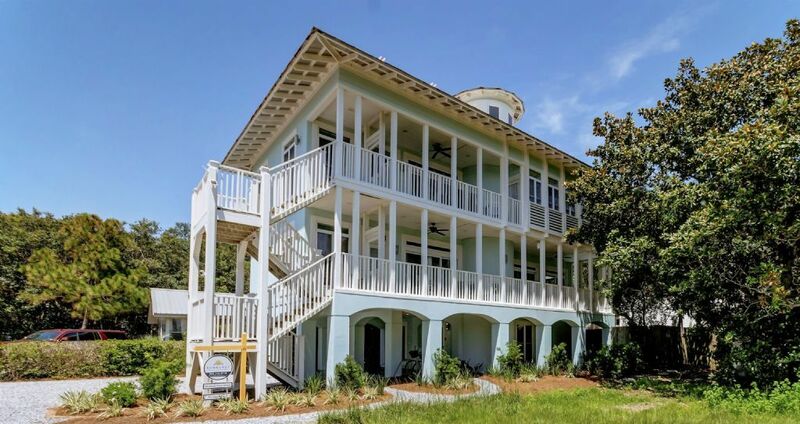 Completely redecorated and renovated in 2011, the Elizabeth White House is an excellent four story rental home located in Seagrove Beach, Florida. This home features two family rooms, four bedrooms, four and one-half baths and sleeps 12. Enjoy the gulf views from the large porches, sunroom and fourth story roof decks on East and West sides. Other features include refinished oak hardwood floors, tile floors, crown molding, and ceiling fans throughout. Large 12 x 24 private heated pool (fees apply for pool heating)! Three houses from Gulf, two blocks to Seaside, incredible views of both! Ground Floor: The ground floor has large king bedroom suite with LCD TV, dresser, side chair and a private bath with river stone tiled shower. Large laundry room with super capacity washer/dryer. An elegant curved interior staircase runs from all floors to the roof decks. Second Floor: The kid’s family room on this floor is equipped with a wet bar, mini-refrigerator, microwave, icemaker, LCD TV, DVD, large sectional sofa with queen sleeper, game table for the puzzles or cards, and shelves full of puzzles, games and paperbacks. Stereo pipes music to the entire first and second floors and porches. Two hall baths - one with tub/shower and one with tiled shower – both showers re-tiled in 2009. The bunkroom has 4 sturdy twin beds and drawers under the bed for storage. Queen bedroom has dresser, bedside table and lamp as well as LCD TV. The kid’s family room and both bedrooms on the second floor open out to one of the spacious porches overlooking the Gulf. Third Floor: This floor features a great room with plush sofa, two overstuffed side chairs, dining table with seating for 8, breakfast bar with seating for 4, and gourmet kitchen. All new kitchen appliances and granite countertops installed in 2011. Entertainment console features a 56” LCD TV, Blue Ray DVD player and stereo that pipes music to the entire third floor, porch and fourth floor roof deck. Cable modem and router provide wireless internet connectivity. Convenient powder room. Large master bedroom suite on third floor includes a king bed, bedside tables and lamps, dresser, LCD TV, adjacent sitting area/sun room with twin sleeper chair, side table and lamp. Private master bath has vanity sink, whirlpool tub, separate walk-in shower freshly re-tiled in 2009. Master bedroom and great room open onto an open-air porch overlooking the Gulf. This porch is outfitted with table and chairs for outdoor dining. Fourth Floor: On the top floor, there is a small inside area with console for setting up cocktails and appetizers and a mini fridge. From this area you can access either the East or the West outdoor observation decks. Two separate outdoor roof decks are outfitted with director's stools for the views and Adirondack chairs for the sun, moon and stars. Outside: The fenced-in private heated pool is surrounded by several loungers as well as a large table and 5 chairs for outdoor dining. Gas grill is poolside. The grounds include a convenient double carport, a hot/cold outdoor shower and foot rinse. There is ample parking for up to four additional cars in the gravel driveway. Convenient beach access just across Scenic Hwy 30A leads you to sparkling emerald waters and sugar-white sands. Concerts, Art Galleries & the many cultural opportunities at Seaside, Swimming Pools, Exceptional Dining within walking distance. Also 18+ miles of off road bike trails and 35+ miles of hiking trails.